Lexus has “hijacked” its best design, technology and craftsmanship to create a product of mastery. That’s the premise of a national campaign breaking today for its seventh-generation ES luxury sedan. Themed, “A Product of Mastery” from AOR Team One, the hero TV spot, “Stolen,” reimagines a classic heist with a cinematic search for a “stolen” vehicle. It features a male voiceover, ending with Lexus spokeswoman actress Minnie Driver giving the “Experience Amazing” brand tagline. 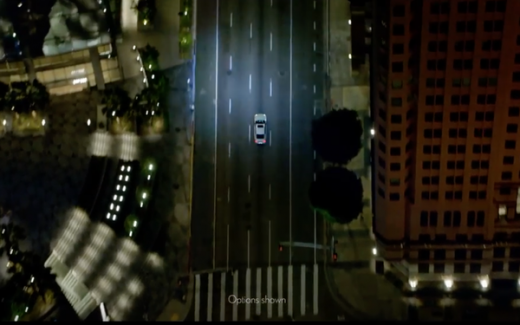 “Using a different voiceover allowed us the element of surprise, where viewers aren’t sure if they’re watching an upcoming trailer for a Hollywood thriller or a Lexus spot,” Cooper Ericksen, Lexus vice president of marketing. Another 30-second TV spot premiering today, “Why Bother,” explores the reasons for achieving mastery. It takes viewers through a series of close-up detail shots of the interior and body lines before revealing the full vehicle. The spot reinforces why one would commit to crafting something remarkable, noting, “When you want to create an entirely new feeling, the difference between excellence and mastery is all the difference in the world.” It features Driver’s voiceover throughout. In firsts for Lexus, Apple CarPlay and Amazon Alexa will be available in the ES, allowing for car-to-home and home-to-car connectivity. Owners can start their vehicle remotely from home or turn on their smart home products from their ES. A series of three “Products of Mastery” digital videos focus on elements of the new ES, like the F Sport driver’s seat, the Mark Levinson PurePlay Sound System and state-of-the-art 12.3” multimedia display. The videos will run on paid social and digital this fall. Walton Isaacson created original TV spots for black, Hispanic and LGBTQ audiences. IW Group handled the adaptions and translations of the general market creative to target Chinese, Korean, and Asian Indian segments via traditional and non-traditional media, including in-language paid search, streaming, and social, according to the automaker. The ES key audience seeks authenticity, says Cooper Ericksen, Lexus vice president of marketing. The national TV spots will air during high-profile prime-time, cable, late night and sports programming such as the Emmys, MLB World Series and “Thursday Night Football.” Digital elements include a homepage takeover on The Hollywood Reporter in conjunction with the Emmys, digital and app banners on Yahoo Sports, and segments on ESPN’s Fantasy Focus Football podcast. Print ads will run in high-end lifestyle and home design publications like Architectural Digest, Elle Décor and Forbes. Out-of-home will include high-profile video placements in Capital One Arena (Washington, D.C.) and Times Square. Lexus will align with passion points of ES customers with activations at the “Elle Women in Hollywood” event and Sunset Magazine’s “Silicon Valley Idea House” this fall. The campaign will run through Oct. 31.